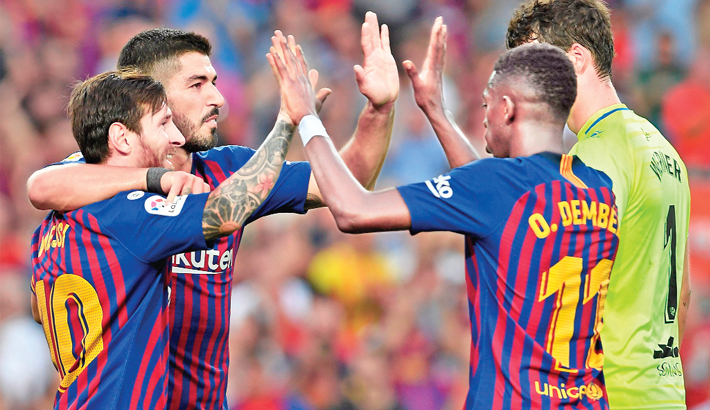 Barcelona forwards Lionel Messi, left, and Luis Suarez, second left, celebrate with teammate Ousmane Dembele after their team’s sixth goal against SD Huesca during Spanish League match at Camp Nou Stadium on Sunday. Barca won 8-2. Barcelona's third win of the campaign in as many games saw Ernesto Valverde's men go top thanks to superior gol difference over Real before the break for Nations League matches.